Ideal for your binders, books or decorative items, this versatile 4-shelf bookcase can meet all of your storage needs. Both functional and attractive with sleek contemporary styling, this bookcase is sure to enhance the look of any room in your home. Young and fresh, the Chrono Collection from Nexera has everything to please; its modern white finish with chic natural maple accents and its mix-and-match design allow you to create your own very trendy home office or entertainment set. This Gascony bookcase combines contemporary and country - the warm look of its rustic finish and its sleek lines- to give you a perfect combination of styles. Its handy storage spaces will keep everything within reach, while the cute molding at the top and carefully worked kick plate round out the esthetics of this piece. Axess 4-Shelf Bookcase, Pure White Ideal for your binders, books or decorative items, this versatile 4-shelf bookcase can meet all of your storage needs. Both functional and attractive with sleek contemporary styling, this bookcase is sure to enhance the look of any room in your home. 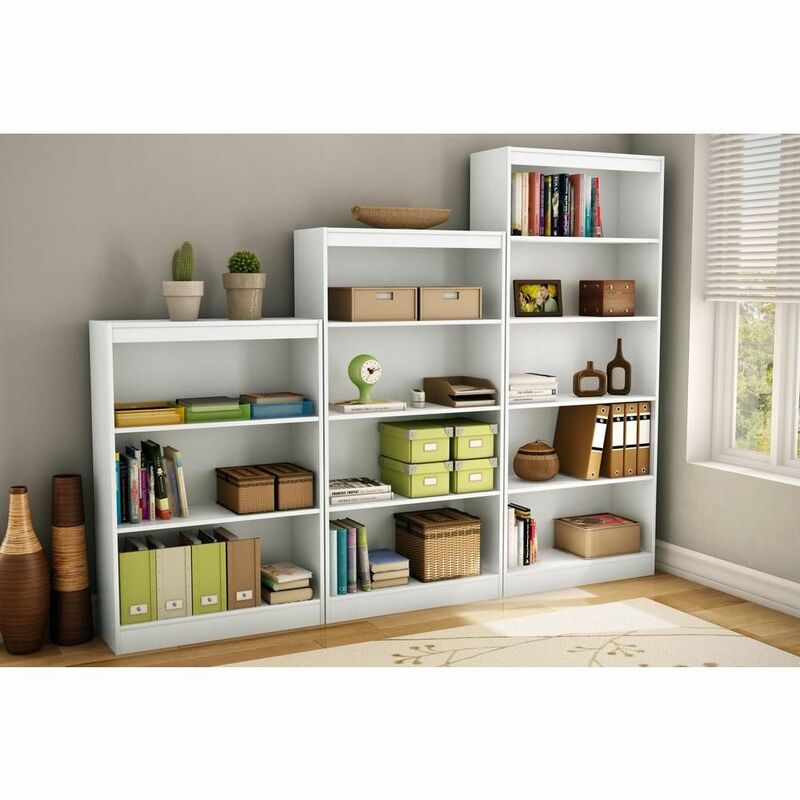 Axess 4-Shelf Bookcase, Pure White is rated 4.1 out of 5 by 77. Rated 5 out of 5 by MoonSpirit from Perfect width for folded quilting fabric! I chose this bookcase specifically because of the width. 4 stacks of quilting fabric, that have been folded using a 6” x 24” Omni Grid ruler will fit on each shelf. The lower height was a selling feature as well, due to the fact that the bookcase had to fit under a shelf, inside a closet. It took me about 1 hour to assemble it, and it suits my storage needs perfectly. Very happy with this purchase. Rated 5 out of 5 by OfficeDweller from Just as advertised. Solid product. Good instructions. Just as advertised. Solid product. Good instructions. Rated 3 out of 5 by feje from This was perfect for the price. My only concern is that the back is cardboard. I would have pre... This was perfect for the price. My only concern is that the back is cardboard. I would have preferred a sturdier back. I don't know how long it will last. Rated 2 out of 5 by Max from Bad packaging. ... Bad packaging. Rated 5 out of 5 by MizKatty from This bookshelf looks nice & is well made. The... This bookshelf looks nice & is well made. The assembly instructions were super simple & everything went together nicely. Great buy! What are the exact dimensions of the cases? Thank you for taking interest in our products. Dimensions are 11.37 in X 27.87 in. X 56 in.